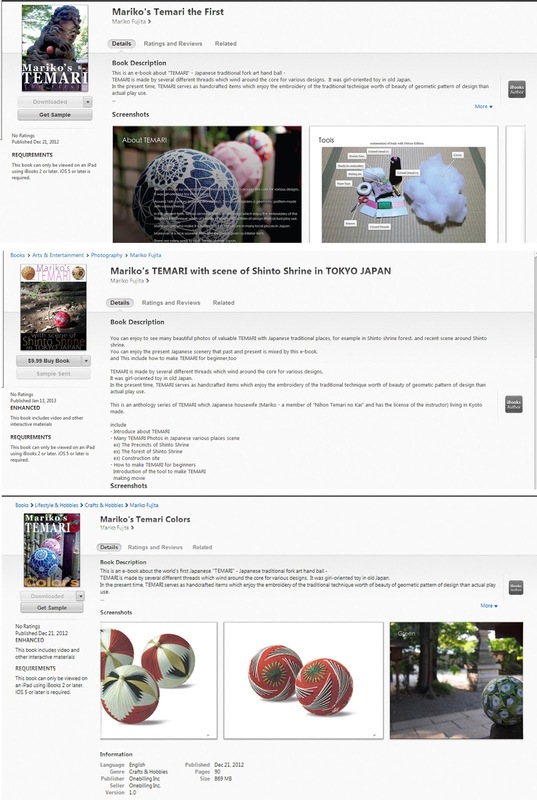 My good friend Shirley sent me a link to a temari book for sale for iPad. You need to have the iBooks app to be able to open the book and it only works on an iPad (I thought it might work on my iPhone but it didn't so now I am the owner of a new iPad mini). The Author is Mariko Fujita, I understand that she is a member of the JTA and also has a certification for teaching. Her son has helped her publish the books. Shirley tells me that she met Mrs Fujita at a temari class she took in Japan a few years ago. Here is a screen shot from the iTunes store. I have purchased the first book (well it is free so I guess I should say downloaded it) and the Colours book. I noticed that there is a new book with the images taken at Shrines in Tokyo. I might get that in the future but possibly the temari are the same. There are no pattern directions in these books but the pictures are lovely and there is an interactive section in the colours book which details the items used for temari making (click on the labels for more information) and also has 4 videos you can click on which show how to make the base, divide with paper strips and then stitch a simple design and add an obi. If you are a book collector (like me) you may be interested in this series. Just so you know I don't have any affiliation with the author or commercial arrangement of any kind. Do you know of any other cool temari information available for iPad? Post a comment below to share it. Thanks for the heads up! I'm off to go book shopping!